The 2015 series is only through eight events, but this is already Michaelis’ second cash. He notched a min-cash in the record-breaking Colossus event earlier this week. 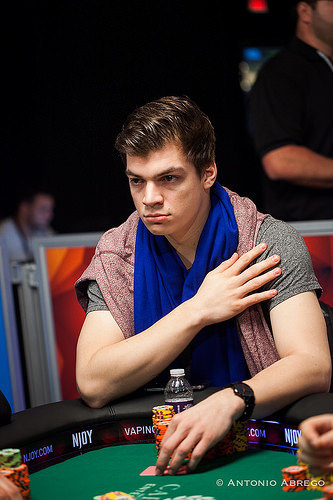 The final table was dominated by Michaelis and his heads up opponent, Tom Marchese. The two combined to knock out every single one of their final table foes. Michaelis started out red hot, knocking out the first three players at the final table, followed by Marchese knocking out the fifth and sixth place finishers. It was back to Michaelis’ turn, and he knocked out the fourth place finisher, David Eldridge, when the two players got all of the chips in the middle preflop with the same hand. Instead of chopping up the pot, Michaelis hit a flush on the river to continue on his rampage of the final table. 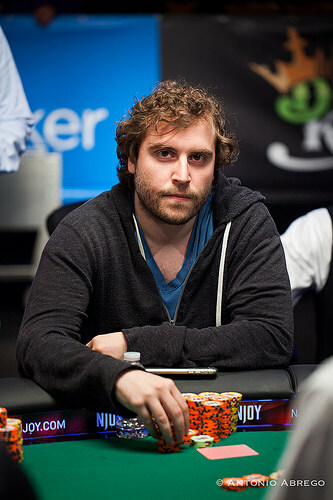 Marchese eliminated Jesse Cohen in third place, leaving the two heads up for the bracelet. "I was running insane basically. I had a straight flush against a nut flush, I had a couple sets. My bluffs worked out. Everything worked perfectly actually," said Michaelis. Michaelis entered heads up play as the chip leader over Marchese. He held the chip lead throughout most of the match. At one point, Marchese had worked his way up to even out the chip stacks, and even took a slight lead. However, this was short lived for Marchese. Shortly after Marchese took the lead, Michaelis came roaring back and won a few big pots in a row to bust him. Marchese, who has over a half a million in WSOP earnings, had to settle for the second place payout of $117,199. This marks Marchese's 11th WSOP cash and fourth final table. He is still in search of his first bracelet. Michaelis is a student who just recently finished his bachelor's degree in media and communications management, but said that he will probably continue his studies. The 24-year-old considers himself a tournament player. He plans to play the Main Event in July, but is unsure what the rest of his WSOP schedule looks like at the moment. Running into a six-figure cash this early into the series opens up a lot of opportunities for a tournament specialist. This event's final table featured players from five different countries (Austria, France, Greece, U.K. and U.S. Austria was blanked in the bracelet category last year, but they pick up an early bracelet this year with Michaelis' dominating performance. Just missing out on the final table, but making it to the third and final day of play was the 13th place finisher, Andrey Gulyy from Russia and 14th place finisher, Artem Metalidi from Ukraine. The international players have come out in full force at this years WSOP in search of bringing home gold. Other notables to earn cash in this event include: gold bracelet winners Tristan Wade (11th) and Eric Baldwin (18th), as well as 2012 Big One for One Drop winner, Antonio Esfandiari (45th). The 2015 WSOP has just one more pot-limit hold’em event on its schedule, which is $10,000 Pot-Limit Hold’em Championship. The three-day tournament begins this Thursday. Paul Michaelis Wins Event #8 Pot-Limit Hold'em for $189,818! Just before the 20-minute break, Paul Michaelis lost the chip lead for the first time since the start of the final table. It took him just three hands to get it back, and on the fourth hand, the tournament was over. Tom Marchese starts the action with a raise to 100,000, and Michaelis three-bets to 280,000. Marchese rechecks his cards, then announces all-in. Michaelis quickly calls, but doesn't like what he sees. Marchese is in great shape to even this heads-up battle again, and things are looking smooth after the flop. However, the on the turn changes everything, and Michaelis's rail erupts in joy. Marchese is looking for a two outer of his own, but the river is the . The two players shake hands, and Marchese heads to the payout desk. 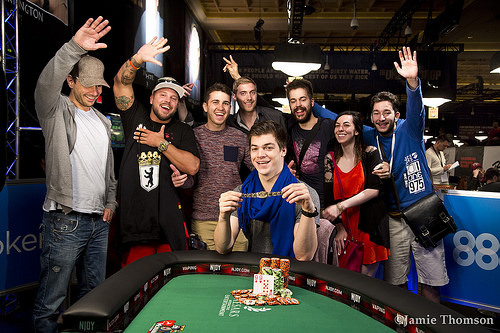 For his efforts, Michaelis takes home $189,818, as well as his first WSOP gold bracelet. Paul Michaelis makes it 110,000 to go on the button, and Tom Marchese calls to see a flop of . Marchese check calls a bet of 100,000, and the hits the turn. This time, Marchese leads out for 235,000, and Michaelis calls. The river is the , and Marchese assembles a huge bet of 640,000, and slides it in the middle. Michaelis goes into the tank, changing his posture several times. He counts out the calling chips to see how much he will have left, then drops them into the middle. Marchese dejectedly flashes his cards, and Michaelis tables for the winning hand. After that pot, Michaelis once again takes a big lead in this heads up battle. Tom Marchese raises to 115,000 and Paul Michaelis calls. The flop is and both players check. The turn is the and both players check. The river is the and Michaelis bets 100,000 and wins the pot after Marchese folds. Tom Marchese gets a walk in the first hand back from the break. Tom Marchese limps in on the button, and Paul Michaelis raises it up to 120,000. Marchese tags along to see a flop of , and Michaelis c-bets to 110,000. Marchese calls it, and the hits the turn. Michaelis keeps his foot on the gas with a bet of 225,000, and Marchese takes a peak at his hole cards, tanks for about 20 seconds, then tosses in the call. The river is the , and Michaelis announces a bet of 600,000. This is for most of Marchese's stack, and he lets out a few deep breathes while tanking. Eventually, he slides in the call, and Michaelis shakes his head at his rail before tabling for air. Marchese flips over , and he drags in the biggest pot of the heads up battle so far to give him the chip lead. The schedule calls for a 60-minute dinner break, but both players agreed before the hand to make it a 20-minute break instead. The heads up battle will resume at around 8:25 local time. Paul Michaelis has the button and folds giving Tom Marchese a walk in the big blind. Tom Marchese makes it 90,000 to go on the button, and Paul Michaelis makes the call. A flop of gets a check from Michaelis, and Marchese does the same. The hits the turn, and Michaelis checks again, as does Marchese. The comes on the river, and it's knuckled through one more time. Michaelis rolls over for a pair of sixes, and Marchese mucks his hand. Paul Michaelis raises to 90,000 and Tom Marchese calls. The flop comes and Marchese check-calls an 85,000 bet from Michaelis. The turn is the and Marchese checks. Michaelis bets 175,000. Marchese folds. Tom Marchese raises to 90,000 on the button, and Paul Michaelis calls. The flop comes , and both players check. The same happens on the turn, and the river is the . After Michaelis checks, Marchese bets 125,000, and the German mucks his hand. Paul Michaelis raises to 90,000, and Tom Marchese concedes from the big blind. Tom Marchese raises to 90,000 and Paul Michaelis makes the call. The flop comes and Marchese bets 70,000 and Michaelis check-calls. The turn is the and Michaelis check-calls a 155,000 bet from Marchese. The river is the and Michaelis leads out for 280,000 and Marchese thinks for about a minute before making the call with . It's the winning hand as Michaelis reveals . Tom Marchese gets a walk in the big blind. Tom Marchese raises to 90,000, and Paul Michaelis three-bets it to 255,000. Marchese announces a pot sized raise to put him all in, and Michaelis makes the call. The flop comes , giving Marchese a freeroll. He gets a sweat with the on the turn, but a black six comes on the river to make it a chopped pot. Paul Michaelis raises and wins the blinds. Tom Marchese makes it 90,000 to go on the button, and Paul Michaelis calls it. A flop of gets a check from Michaelis, and Marchese knuckles as well. The hits the turn, and Michaelis leads out for 95,000. Marchese tags along, and the river is the . Michaelis tanks for about 30 seconds before betting out 150,000, and Marchese lets his hand go. Paul Michaelis raises to 90,000 and Tom Marchese calls. The flop is and Marchese checks. Michaelis bets 85,000 and Marchese calls. The turn is the and Marchese taps the table with his index finger. Michaelis makes another bet, this time for 165,000 and Marchese quickly folds. Tom Marchese raises to 90,000 on the button, and Paul Michaelis makes the call. Shaun the Dealer puts out a flop of , and the German chip leader checks. Marchese fires out 80,000, and that bet is call. The comes on the turn, and Michaelis checks again. Marchese does the same, and the hits the river. This time, Michaelis assembles a bet of 145,000, and Marchese only takes a few seconds to fold.